Well it looks like we're in for a treat with this month's book club choice, Before I Go To Sleep, by S J Watson, is a psychological thriller - exactly the type of book I love, and it wasn't even my turn to pick! In S.J. 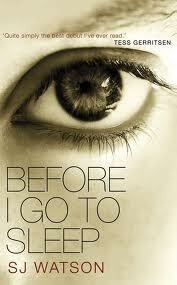 Watson’s debut thriller, Before I Go to Sleep , Christine doesn’t have trouble sleeping. She just can’t remember anything when she wakes up. Every morning, her memory reboots and she has to relearn everything about her life, the strange man in her bed, and how she arrived at this condition. At her therapist’s suggestion, she starts recording details in a secret journal, and finds that the people around her may not be telling her the whole truth, if any at all. Worse yet, what she doesn’t know could definitely hurt or even kill her. Why not read along with us and post your review here! Ah go on! It sounds brilliant!!! My schedule is so full already, but this sounds terrific. I may have to make time for it even if it's only thirty minutes a night before bedtime. I Love Love love psychological thrillers. This Sounds interesting. I might actually indulge myself. I should really make more time to read. This sounds like an amazing read. :-) Reminds me a little of a recent romantic comedy with a very dark twist. Liz and Krystal deffo read along - if wud be great to get ur reviews! I saw a review of this and it is supposed to be brilliant, my (21st +) birthday is coming up soon I may stick it on my wish list. Oh do Brigid - and let me know what you think of it! Good luck Beaded Pillow - if you find it - let me know how you get on! Bet you will love it irishminx! Just finished it - absolutely brilliant read! Thanks Susan - will post review with others on new post! This was such a great read! I couldn't put the book down and even more so towards the end. It blew me away! Actually had me on the edge of my seat. I would definitely recommend this book to anyone!